Tag Archive | "Sparkling Gourami (Trichopsis pumila)"
The Sparkling Gourami (Trichopsis pumila) also known to tropical fish keeping enthusiasts as the Pygmy Gourami or Dwarf Croaking Gourami is found throughout the lower Mekong River basin in Cambodia, Laos, Thailand, and Saigon, southern Vietnam. 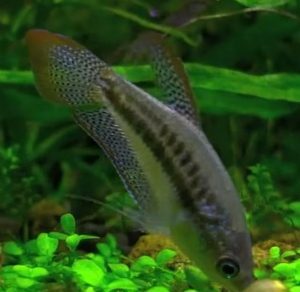 Sparkling Gourami are closely related to Bettas and Pseudosphromenus and have a distinct preference for sluggish, still to stagnant environments that are dense growths of aquatic vegetation. They are collected from all types of slow moving lowland habitats in their range from rice paddy fields, canals, swamp forests, peat swamps, small river tributaries, and even roadside ditches. Sparkling Gourami are often found alongside Anabas testudineus, Betta siamorientalis, Lepidocephalichthys hasselti, Macrognathus siamensis, Monopterus albus, Pangio anguillaris, Trichopsis vittata, T. schalleri, and Trichopodus trichopterus. Trichopsis pumila are a small peaceful species that is unique in it’s ability to produce sounds, hence it’s common name Dwarf Croaking Gourami. The sounds are believed to be used in lieu of physical confrontations and during courtship when females produce a “purring” sound to initiate spawning. Sparkling Gourami, like other Anabantoidei, are a labyrinth species that allows them to breathe atmospheric air during periods of low . The Sparkling Gourami has a dorsal fin that is set well behind the base of their pectoral fins. They have a long single pointed spiny pelvic fin ending with a filament, pectoral fins that end in a single spiny ray, and a semi rounded caudal fin. Trichopsis pumila are a colorful iridescent blue to blue green bodied species that posses a single solid dark stripe along the lateral line of the body and a second stripe comprised of a series of dark blotches above which, depending on the mood of the fish, will darken or completely fade out. The fins are tinged with red to a brick color and spotted. caudal fins. Sexually mature females can be more easily identified by placing a strong light behind the fish. The ovaries in females will be clearly visible below the swim bladder. 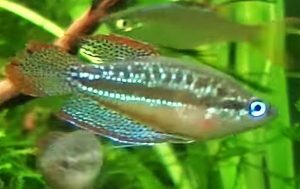 Sparkling Gourami are best housed in a densely planted aquarium of at least 10 gallon capacity with a sandy or fine gravel substrate covered by some Indian Almond Leaves or other type leaves, some driftwood or bogwood with Microsorum or Taxiphyllum spp. attached, and some smooth rocks fashioned into caves to provide shelter. The addition of dried leaf litter encourages the growth of beneficial microbe colonies as they decompose and is a valuable source of food for the fry. Sparkling Gourami like a well shaded tank, so floating plants like Water Hyacinth , Water Lettuce, duckweed, or Cryptocoryne spp. should also be provided along with a tightly fitting tank cover to keep them from jumping out. The cover also allows them access to the humid air they need during spawning. Trichopsis pumila can be housed in a community environment with small peaceful schooling species like rasboras, barbs, danios, small loaches, Otocinclus, Swordtails, Tetras, Endlers, etc. but they do better as pairs or in small groups in a biotope setting. Do not keep them with small shrimp such as Caridina cantonensis, Neocaridina heteropoda, etc. as they will quickly become a meal. Sparkling Gourami are shrimp assassins that are particularly fond of eating Red Cherry Shrimp. 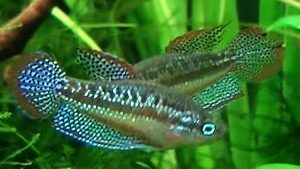 Sparkling Gourami are easy to breed when maintained alone or in a small group biotop setting. It is important to provide a tightly fitting cover or some Saran Wrap type material over the tank to provide a layer of warm, humid air for the fry. This is necessary for the development of their labyrinth organs. Like Betta Splendins, Sparkling Gourami are bubble nest builders. Males will build a nest under a plant leaf, under the roots of a floating plant or any other surface vegetation, and will keep the female away from it until the nest is completed. Spawning usually occurs underneath the bubble nest with the typical embrace of the male wrapping himself around the female. The milt and eggs are released in a cluster which is then taken to the nest by the male. The procedure is repeated several times until the female is spent. The male will tend to the nest and guard it from interlopers until the eggs hatch, usually in 24 to 48 hours, and the fry are free swimming. The fry will stay in the bubble nest until their eggs sacs are absorbed, usually within 2 or 3 days. Once the fry are free swimming, the male will lose interest and leave them to fend for themselves. The parents will usually will not eat their offspring. The fry require infusoria for the first few days until they can accept microworms , newly hatched brine shrimp, or a commercially prepared fry food . Small daily water changes are recommended until the fry are able to eat larger foods. In the wild, Sparkling Gourami are opportunistic feeders that eat insects, small worms and other invertebrates. In an aquarium environment, they will accept good quality flake foods and plenty of live, frozen, or freeze dried bloodworms , brine shrimp, ghost shrimp , Daphnia , etc. Although Sparkling Gourami (Trichopsis pumila) are not a common item in tropical fish keeping shops they can usually be ordered from them or online from a variety of sources at reasonable prices.